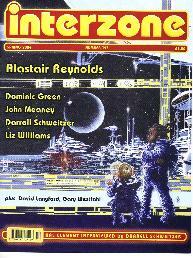 This is the last David Pringle edited/published issue of Interzone, and the Pringle era ended with a whimper and not a bang. With issues only appearing sporadically, many distributors had dropped the title by the time this issue appeared, and none of my usual bookstores had it in stock. So it is a peculiarly nostalgic review, in that I finally got a hold of this issue after having read the first three issues of the Andy Cox edited/published incarnation of this stalwart British mag. I have to own up to a bit of a let-down with this story, as Reynolds is an author who has impressed me for several years. Very unusual for him, the story has a contemporary setting, and features a journey through snowy treacherous roads by Moria Curbishley to the remote home of an old college friend. Ian lives an isolated life, and is in one of his depressive moods. She fears that he may be suicidal, but it is far more complex – he has come to the conclusion that they are living in an Earth which has the odds stacked in favour of longevity : out of all the quantum Earths, the dice on this Earth are loaded in our favour. Or, more appropriately, the chambers in the revolver with which he is set to play Russian Roulette will always end up with the empty one. He discusses his theory with Moira, and proceeds to test it with the revolver. He gets several blank chambers in a row. Then..
Moira’s journey home, however, is not without incident, which gives her pause for thought. Whilst the story is fine as far as it goes, in comparison to Reynolds other work, this is fairly low-key. A very bleak story. Relatively near-future London, with the city and the society in a shambles, and with Aud, a young woman with a mild learning disability, doing her best to care for her baby. We find out that fertility is far from being taken for granted, and there is a mystery about where her baby came from. As she flees to the relatively safer shores of Ireland, we find the chilling truth about her ‘baby’. Excellent. A story which would not be out of place in Interzone’s new sister publication ‘The 3rd Alternative’. A very strange steampunky/bakerlitepunky Earth, in which the bodies of the dead are used, quite vividly, to power huge subterranean furnaces. However, the bones of some artistic types can in fact induce an almost orgasmic revelatory dreamtime for those with a penchant for such things. When several opera singers disappear, a cop is set on the trail. He has also to prevent the disappearance of a globally-renowned diva, who is to sing in the opera house in his country. He is not successful in that task, and is himself drawn into the perverse worship of the Diva’s bones. Darrell Schweitzer. The Order of Things Must Be Preserved. Continuing strange goings on in the small town by the harbour to which dead, but non-decomposing bodies are delivered. Miss R__ the schoolma’am finds that she is having strange feelings for the Mayor, but finds that they ultimately lead her to her downfall. Dominic Green. Three Lions on the Armband. A very blackly humorous near-future England, which Green has used as a setting before. Here, under the humongous motorway flyover junctions up North, a very strange collection of religious zealots and refugees eke out what passes for an existence. One sage old gentleman offers the opportunity to achieve a higher plane of existence (settling on Venus, actually). However, things do not go as planned. Gary Westfahl reviews gambling slot-machines with an sfnal bent (no, really). He does answer one question which had bugged me for years – why he reviewed films which he palpably wasn’t going to enjoy. He lets us in on a secret – he hates having fun, and he sees activities such as going to the movies as annoyances, keeping him away from productive labour. Paul Brazier reviews Gwyneth Jones’ ‘Midnight Lamp’, Mary Gentle’s ‘1610: A Sundial on a Grave’, Elizabeth Hand’s ‘Bibliomancy’ and is mightily unimpressed by DePauw University’s ‘Science Fiction Studies #91’ which looks at the ‘British Boom’. All in all a final issue which gives the Pringle era a fitting send off.